I have found that there is a great need for information on how to help young horses with their many leg problems. Not only dwarf miniature horses, but normal miniatures and big horses as well. I do not claim to be an expert on horses or their legs by any means; however, I have had a lot of experience with horses that have leg problems, and I wanted to write down some of my experiences and include photographs, hoping that it may be of some help to others out there seeking advice on leg problems in horses. My first experience was with my little dwarf miniature horse, Tessa. I didn’t adopt her until she was nine months old; she had never had her hooves trimmed until the day we picked her up. Tessa’s coronary bands were getting very close to the ground! I took her to my equine veterinarian, and he said that she needed to have surgery on both legs. He told me that he was going to insert metal screws into her legs and put her in braces for 6 weeks. I wish I had known about making these shoes when I first got little Tessa. I know I could have corrected her legs with the little * Magic Shoes*, and she would not have had to go through that awful surgery. Tessa is doing very well, however, arthritis seems to settle into the joints of dwarves at a very early age, and I think it is beneficial to start them on a joint supplement as soon as possible. It should have all three of these ingredients: Glucosamine, Chondroitin and MSM. When Tessa was about four years old, I was asked if I would take another little dwarf; he was 12 days old and all of 10 pounds and 13 inches tall, I named him Little Bit. The night he was born the owner of the mare took him and his Momma to the vet clinic, because his legs were too weak to hold up his weight, and he was too short to reach his Momma’s teats. The vet braced all of his little legs and tubed him twice with the mare’s colostrum, but told the owner that she did not expect him to live through the night. Well, she was only the first of many vets that he would surprise in the next three years! I am sorry to say that at 17 1/2 years old, life was just getting to hard for my sweet little Tessa. Arthritis was in every one of her joints and her front legs had become so very crippled up....she was very tired, weary...... I felt that I had to be strong for her, to give her my last gift of love and have my vet help her cross over the Rainbow Bridge. When I got Little Bit, the breeder had stopped bracing his back legs, but as you can see in this picture, the tendons were still very loose. Little Bit was walking on the bulbs of his hooves instead of his hooves. But after about a month and a half of trying to keep some little wooden shoes taped to his back hooves, his back legs had gotten strong and the tendons had shrunk back up to where they should be. His front legs were another story; Little Bit’s fetlocks were very weak, especially the left one, and without braces he would walk on the side of his hooves. When Little Bit was almost 3 months old he started getting a pressure sore on his left fetlock from his braces, and I knew something else had to be done for him. I took him to Texas A & M University and Dr. Honnas trimmed a lot off of his hooves; they bled, but he said it had to be done. Then he used a heavy mesh and a product called Technovit to make his hooves larger around at the bottom. That was all it took to keep his little hooves from turning over! That was the first time I had ever seen him standing without braces! I just stood there and cried. But because the Technovit had sealed off the entire bottom of his hooves, he started getting an infection in the bulbs of his hooves, so the extensions had to be removed. I had bought a little shoe from a lady, but it was made out of a thick piece of metal and I felt that it was too thick and heavy for Little Bit to wear, especially since he only needed a shoe on one hoof. Also, that shoe was just not designed right for his needs. That was when I met a lady on the Internet, who also had a little dwarf with weak fetlocks. She told me that her husband was a shop teacher and could make me a little shoe out of a thin, lightweight aluminum. If I would send him the pattern, he would make a couple shoes for their little dwarf, too. I soon learned how to use my little saw to make the *Magic Shoes* myself. Little Bit was just a little over 3 years old when he passed away; and he was still wearing his shoe; his fetlock was still a bit weak. He probably would have been able to walk all right without the shoe, but I just did not want to take the chance of losing all the progress that he had made. You cannot expect to be able to correct a horse’s legs overnight; it may take weeks, months or even years. You just have to be consistent with keeping the shoes on the horse and have lots of patience. Shortly after my Little Bit passed away, a friend of mine contacted me about a little eight-week-old filly she had that was born with tendon laxity in all 4 of her legs. This filly was actually walking on her fetlocks; her hooves were not even touching the ground! For the first two weeks of her life she was at the vet clinic because she was also a “sleeper” foal. The vet taped tongue depressors to the bottom of her hooves, but once my friend got her home, she could tell that this was no longer working, so she took her up to Texas A & M. The vets there made her extensions like they had my Little Bit, except the extensions were in the back of the hoof only. Here’s a picture of the filly when she was about three weeks old, before they had put any extensions on her hooves. In this picture you can see that the tongue depressors had helped her, especially the front legs, at least she was no longer walking on her fetlocks, but she was still walking on the bulbs of her heels. My friend felt that she just did not have the time and patience for this filly, so she gave her to me. That is when I took the Technovit extensions off of her and glued the little Magic Shoes to her hooves. About four weeks later I took her back up to A & M and Dr. Honnas trimmed all of her hooves again. When he stood her up this time, she was walking on all four hooves!! He was really surprised at how quickly she had gotten strong; four weeks is a lot less time than four to six months like he had thought it would take! I am very proud of Fairy’s progress! She is such a little sweetheart. Thank you Maxine for giving her to me! Fairy at 3 months old, foot-loose & fancy-free! 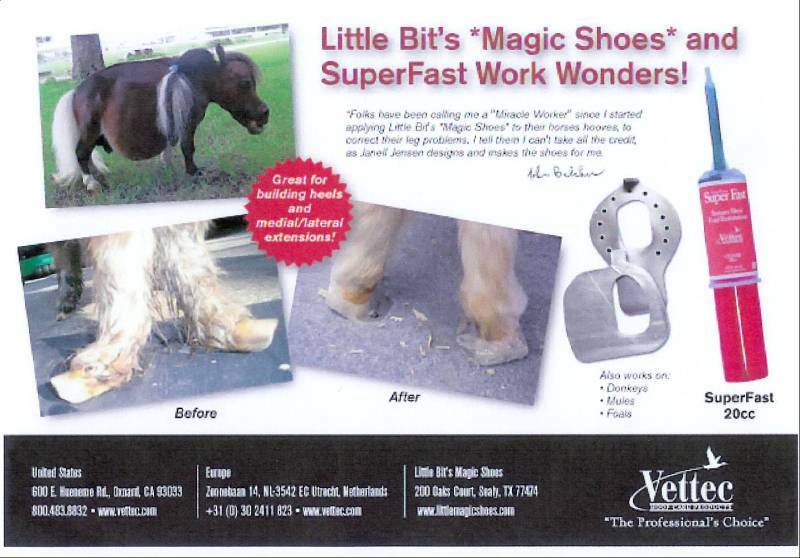 These shoes are not just for dwarf Miniature Horses, or Miniature Horses, they will work on any size horse. prices to glue solid metal plates to their horse's hooves or even to just make an extension on the side of the hoof with the glue.....to me this is just not right! Donations to Little Bits "Help Fund" will be accepted & greatly appreciated. littlemagicshoes@gmail.com for my mailing address to send donations to. animals. Opinions expressed herein are those of the author's . Click on the ad to see a larger picture. Little Bit's Store which is located on Little Bit's Forum, has a list of websites that have items for sale in which some of the proceeds will be donated to Little Bit's Help Fund. The Help Fund was created so that we could rescue an animal out of an abusive or neglected situation if need be, and to help folks pay for the *Magic Shoes* and or glue to apply them with.